Feb. 2010 John Lautner Foundation reprint of the Journal of the Taliesin Fellows Issue 18, 1995 edited by Louise Wiehle and Frank Escher with new material added (see bibliography below). Courtesy of Judy Lautner. 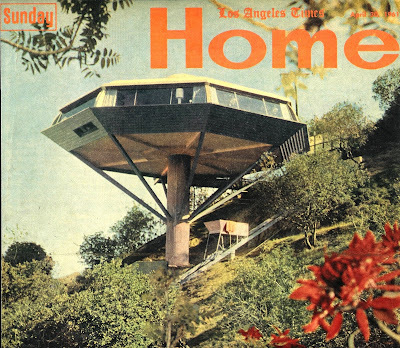 The 2008 Hammer exhibition "Between Earth and Heaven: The Architecture of John Lautner" and Getty-Hammer Symposium "Against Reason: John Lautner and Postwar Architecture" created a flood of publicity and generated much renewed interest in Lautner's life and work. The traveling show is currently on view at the Palm Springs Art Museum after an interim show in Glasgow, Scotland. This motivated me to look deeper into the literature for information on this unique and creative genius. A logical starting point for me was to perform a "Lautner" search in my 8,000 item "Julius Shulman Annotated Bibliography" prepared while researching a book on Shulman cover photos. The search resulted in 275 articles with Shulman photos of Lautner projects. Shulman has logged close to 75 assignments for Lautner projects over the years for various clients ranging from Lautner himself to book and article authors, magazine editors, newspaper reporters, exhibition curators, homeowners and realtors. He also used his considerable marketing skills and contacts with publishers and editors to help spread the gospel of modernism according to Lautner to a global audience. This bibliography compiles my Shulman-Lautner findings with the excellent bibliographic foundation laid by Ludolf von Alvensleben in the 1991 Viennese exhibition catalog "John Lautner: Architect: Los Angeles", and "John Lautner, Architect" with text by Lautner and edited by Frank Escher, and the John Lautner Foundation web site. Listings were also gleaned from the end notes in "The Architecture of John Lautner" by Alan Hess and "Between Earth and Heaven: The Architecture of John Lautner" edited by Nicholas Olsberg, et al. Building upon these sources, exhaustive searches were also done on ProQuest-Los Angeles Times Historical, RIBA, Avery, WorldCat, WilsonWeb, Art Index, Google and many other databases and sources resulting in well over 1200 items discovered to date. Feedback on ways to improve this compilation and submittals of new items I have undoubtedly overlooked are always welcome as I intend to update this bibliography periodically. Entries in the bibliography are chronological with divisions by year. Each year begins with a brief chronology of important events in Lautner‟s life followed by a list of the year's projects and finally, bibliographical items published during the year with my annotations. 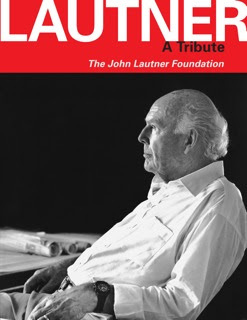 I have compiled the chronology and project lists from the ones provided in the aforementioned Ludwig von Alvensleben exhibition catalog and Lautner-Escher monograph, the 1999 Barbara-Ann Campbell-Lange "John Lautner" monograph edited by Peter Gossel, the 2008 "Between Earth and Heaven: The Architecture of John Lautner" exhibition catalog edited by Olsberg, the 1998 "The Architecture of John Lautner" by Alan Hess and the project database prepared by Tycho Saariste available on the Lautner Foundation web site. I also have not taken the time to edit items from the Shulman bibliography that contain work by others in addition to Lautner. Readers may find it interesting, however, to see what company Lautner was keeping in these group articles. Illustrations are from my personal collection or from various internet sources and credited in the adjacent bibliography listing.